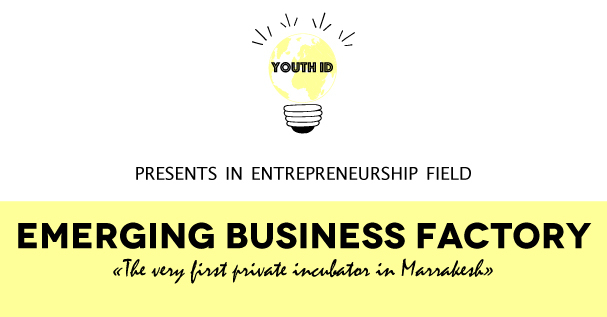 Youth ID met Emerging Business Factory in the district of Sidi Ghanem. It was an old industrial district of Marrakesh facing the textile crisis in the 80s. So, naturally, Emerging Business Factory was created on december of 2015. It is the very first private incubator of Marrakesh. Its creation symbolizes a new tendency in this moroccan red city : the digitalisation of work. The CEO of this organization is Taoufik Aboudia, a serial entrepreneur, who shares today EBF’s keys of sucess -and his vision of the the youth. To begin, what is an incubator? Let’s begin simply with the definition of an incubator because we will for sure meet others incubators with Youth ID project. An incubator is a mentoring structure to help you to create your own company. Currently, everyone is speaking about incubators thanks to the good image of entrepreneurship and start-up culture. Many think that they are fundamental to empower the youth. Why? a computer + a good wifi + ideas and knowledge + hours of work. Four elements that every young can have or find easily. Furthermore, inside an incubator, young people are growing fast because they are here to create and rule companies, often digital and with high added value. Incubators could be powerful tools for youth emancipation and training! With 120 places of work, EBF is the biggest incubator in Morocco. It has welcomed between 10 to 16 start-ups for one year. They are all using digital and new technologies. The average age is really young, around 25. The team are gathering various profiles (commercials, engineers, philosophers… even one dermatologist is developing her application to monitor alone your skin evolutions). Emerging Business Factory’s residents work with the whole world, as employees of multinationals or freelance (just juridically defined in 2016 in Morocco). Whatever your degree, whatever your age, whatever your place of living, only the wifi and your skills matter to be part of EBF family. It was the aim of our meeting with Taoufik Aboudia. He created EBF to encourage moroccan youth. Whereas they could easily develop business thanks to new technologies and their proximity with French market, they are afraid of taking risk. Yet, it is indispensable for entrepreneurship. Social pressure encourage most students to become public servant because it is stable and security jobs. Taoufik would like to change that global patriarchal culture. Even before the end of his high school he was working in a cybercafé to become more independent. Then he bought that place and began the road of entrepreneurship, with successes but also failures. That’s why he wants to transmit a culture of risk through an intergenerational dialogue. Taoufik answers without a doubt “lack of discipline on the study of P&L“. We did not dare to admit, with such a quick answer, that we forgot what is the P&L. It is one of the financial statements of a company and shows the company’s revenues and expenses during a particular period. In just one year, EBF supported with success 6 start-ups in difficulties. For example Linkry who pivot for the good in its business model “by adopting the space and network of EBF“. “We have also participated on COP22 in Marrakesh with our partners Comm1possible or Pascal Molina’s baleine mécanique“. How to attract people matching without your needs? The key answer is global. The best way would be to sensibilise about entrepreneurship as soon as possible. It is already too late when we spoke about it at the end of the studies or when young people are unemployed. Of course we can keep on-going learning all life long and we do it in EBF with continuous trainings. But the sooner the youth will consider entrepreneurship as a solution for their life, the sooner they will be independent and will create wealth for our country! Part III : How to duplicate EBF’s success?